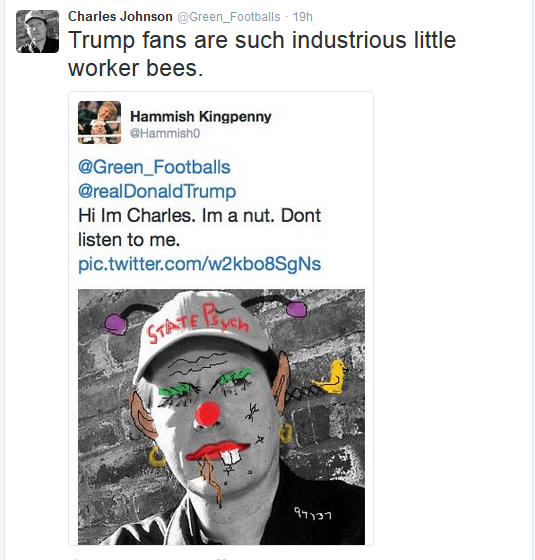 A Trump supporter makes a hysterical Photoshop of Charles. Charles is distraught that Obama is leaving the Presidency. He goes on twitter to lament Obama leaving office. This is so good. We're gonna miss this guy. Despite being cited in Breivik’s manifesto, Charles still denies this connection. Many Berniebros rightfully point out the ties Charles has with Breivik. He still goes into denial over this established connection. Obviously, if Breivik was aware of me at all he considered me a *traitor* to his fucked up cause because I renounced all of these people. Someone was not buying the ageing hippie’s excuses. Charles can run, but he can’t hide from the Breivik ties. Both Charles Johnsons are loathsome individuals that I can’t stand. But at least Chuck is a player on the political scene while the Ponytailed One is a mad man ranting on Twitter. Our favorite loser is complaining that Chuck C. Johnson was at the Republican convention. Charles is mad he is getting no invite to the DNC. Yeah, I did. I wandered over to The Swamp to see what brilliant commentary I could find knowing it was a lost cause. I wasn’t disappointed, and the cause remains lost. I couldn’t take much more as the rest of the comments were just as inane, sprinkled with Charles’ witty bitty Twittys, and his big buggy website kept crashing my plugin container. With content like that, it’s only a matter of time before Charles has to pay someone to buy his Little Green Footballs. Ride the Decline. Terrorism struck again in France, this time in the southern city of Nice. There was a large crowd celebrating Bastille Day and watching fireworks. A truck plowed into the crowed and killed over 70 people. LGF commentator Electrotek is more concerned about how the French may view Syrian refugees than the terror attack itself. The priorities of LGF commentators never cease to astound me.